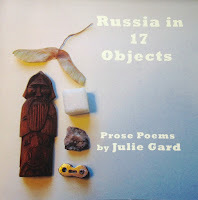 Russia in 17 Objects won the 2010 Tiger's Eye Chapbook Contest and came out in December 2011. Here's a review in Prick of the Spindle. Background info: In the summer of 2008, I traveled to western Russia with the assistance of an Individual Artist Grant from the Arrowhead Regional Artists Council/McKnight Foundation. I collected random found objects, picking them on the street or subway or buying them cheaply, and wrote about them in order to explore my seventeen-year relationship with Russia as it was and is. Additional recognition: This project was awarded second prize in the 2010 Bitterberry Press Fall Chapbook Contest and was named as a finalist in the 2010 Blue Light Press Chapbook Competition. "Kalevala" won the 2010 Travel Writing and Postcard Competition at Leaf Books. "Tiny Plastic Mouse" and "Embroidered Flower" appeared in the spring 2010 issue of Gertrude. "Wire," "Feather," "Stone," and "Maple Leaf" were published in Tiger's Eye, Fall 2010, along with an interview.